TRENDFOCUS has just released its CQ3 ’17 Quarterly Update for the NAND/SSD market. Only one segment, enterprise PCIe, saw unit growth where every other segment – client drive format factor, client modules, enterprise SATA and enterprise SAS, all declined from the prior quarter. 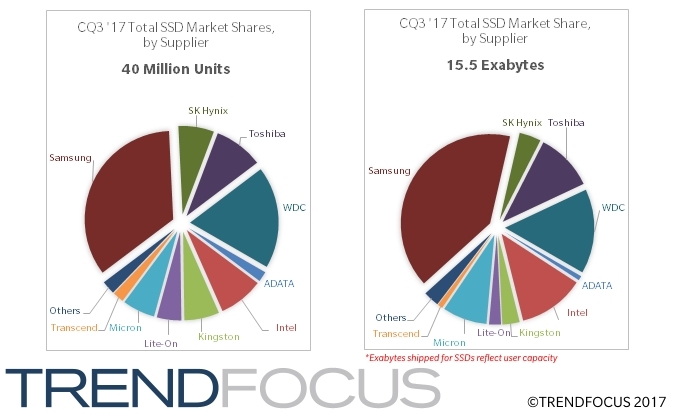 The enterprise SSDs market declined 7% Q-Q, which includes SATA, SAS and PCIe. The bright spot within this overall decline was the healthy 15.6% increase in PCIe units. As hyperscale companies continue to migrate away from SATA, PCIe should continue to grow in both units and exabytes. SATA, still the highest volume of all enterprise categories, managed to stay just above 4 million units shipped but did decline sharply in CQ3. However, exabytes shipped in the SATA SSD market grew due to the transition to higher capacity units. SAS SSDs now represent the lowest unit volume of the enterprise SSD segments, but still maintain a large lead in average capacity shipped at over 2.1 terabytes. Client SSD shipments fell 4.5% sequentially but exabytes shipped was flat. Client modules now represent almost 2/3 of all client SSDs shipped. Even more impressive within this segment is that M.2 PCIe is now 50% of this segment – illustrating the continued migration for major Notebook OEMs to integrate with this interface. Average prices remained high, although quarterly increases seen since mid-2016 have abated. NAND bits shipped grew 12% sequentially in CQ3 as the 3D transition continues to gain momentum. 3D NAND accounted for more than 50% of all bits shipped for the first time in CQ3, as all of the NAND suppliers are well into the transition. Samsung continues to lead the NAND market followed by Toshiba and WDC. New NAND fabs are slowly ramping up and should have more meaningful impact in upcoming quarters. SSDs and phones, combined, consumed over 80% of all the NAND bits produced in CQ3, and this trend should continue as demand for both applications remain solid. This entry was posted in TRENDFOCUS Blog, Uncategorized and tagged Client SSD, Enterprise SSD, NAND. Bookmark the permalink.